Find out the secret behind the zombie apocalypse, discover the downside of going Goth, learn why there's a monster under the bed, and savor a revealing form of bio-engineered revenge. 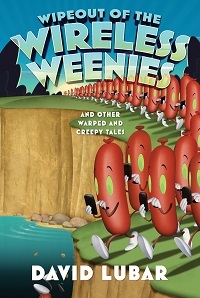 This is just a hint of the warped, creepy, and funny contents of the newest Weenies collection. "With its mix of humor and chills, this collection is a sure bet for fans of R. L. Stine's Goosebumps series and reluctant readers." "More than 30 strange short stories will astound middle graders with tales that have endings from the mildly puzzling to the gruesome and bizarre." "His stories are charming, witty, frightening and often, hilarious." "A fine addition to the short story collection and a must-have for Weenies fans." "This seventh collection of tales from Lubar will delight elementary school students, so it is a must purchase for elementary libraries." "They're amazing stories by an amazing author." Available at bookstores nationwide, and from all major ebook vendors.